📷WIFI FUNCTION AND APP CONTROL: Built-in WIFI allows you to change the settings,view real-time footage and take photos with the APP on your mobile phone. The APP supports for both iOS and Android systems, quickly download the record files to your phone, you can edit and share the fantastic moments to your friends or social media at any time. 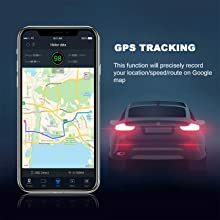 📷BUILT-IN GPS: It can automatically manage the trip and record the vehicle history and driving behavior for you, follow your video alongside a Google Maps screen to exactly show where you were! 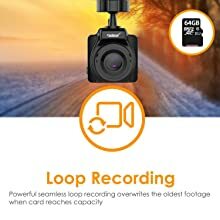 📷FULL HD 1080P: Equipped with advanced Sony Exmor sensor, the dash cam supports FHD 1920*1080P at 30 fps H.264 video recording even at night, helping insurance claims to prove an incident, preventing disputes. 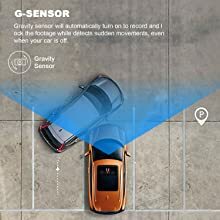 📷EMERGENCY RECORDING FEATURE: Enabled by G-sensor technology, the camera automatically saves footage in the events, which can help to address accident and distinguish responsibility. Help you create a safe driving experience. 📷WHAT’S IN THE BOX: Conbrov DC80 Car Dash Cam,car charger,usb cable,car bracket, card reader,pin,user manual,CD, and our fan-favorite 12-month warranty. Trusted by over 50,000 homes and businesses since our establishment in 2005, Conbrov is an industry leader in Home Security and Surveillance Technology. Whether you need to protect your home and loved ones, keep an eye on things while you’re away, or record moments that matter, Conbrov is here to help. Conbrov DC80 wifi dash cam can be mounted to the dashboard and records the driver’s journey whenever the car is started and moving. It is a crucial tool for ensuring safety on the road and expediting proceedings with the courts and insurance companies in case of an accident. 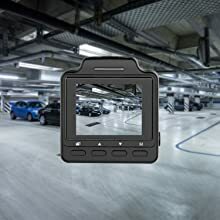 This dash cam can help you guard against illegal activity, show who was at fault during an accident, show direction and more. For anyone who spends a lot of time traveling on the road, our cam is a must-own product. 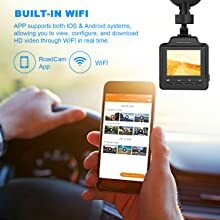 Built-in WIFI allows you to manage your recordings on your mobile phone with the “RoadCam” App, which you can download from Google Play or Apple App Store. This makes it easier than ever to share footage from your trips. 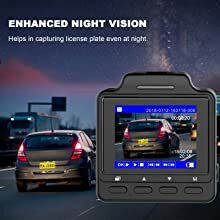 The car camcorder records a full-colored night video although when you drive through tunnels, many details not normally seen at night will be captured by our car dash cam. 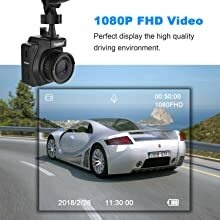 This dash cameras have 1920*1080 video resolution and a high efficient H.264 video encoding, the camera captures clear images in high resolution while optimizing storage space for more footage. Built-in GPS module accessory enables the dash cam to location and coordinates of the motor vehicle. The logging of such details can be played back showing real-time location movements of where the vehicle has been. The camera will lock videos automatically when a suddenly collision or even an unexpected driving incident occurs, which can help addressing accident and distinguish responsibility. Monitor your car’s surroundings while your car is parked and the engine is off. It automatically begins recording if shock or movement is detected. This feature enables the newest video overwrite the oldest video in sequence with 1, 3, or 5 minute intervals. Locked files will not be overwritten. And it Supports the Micro SD card up to 64 GB (NOT Included). 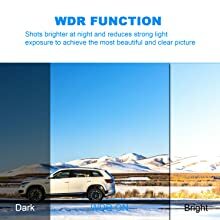 WDR (Wide Dynamic Range) Technology, it makes night shots brighter, and reduces strong light exposure to achieve the most beautiful and clear picture, which will make your journey much more safety.